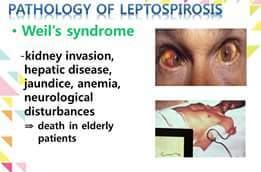 A good clinical history is often the key to accurate diagnosis in leptospirosis. Important features include exposure history and a clinical picture consistent with the disease. The exposure history may reveal direct contact with body fluids or organs of infected animals, or indirectly (eg, via contaminated soil or water). Direct exposure often occurs in occupational cases, while indirect exposure is more typical of cases contracted during travel or recreational activities rivers . Abdominal pain with diarrhea or constipation (30%), hepatosplenomegaly, nausea, vomiting, and anorexia are also seen. Acalculous cholecystitis may be seen rarely but is clinically significant. Subconjunctival hemorrhage is the most common ocular complication of leptospirosis, occurring in as many as 92% of patients. Patients should be managed in a monitored setting because their condition can rapidly progress to cardiovascular collapse and shock. Access to mechanical ventilation and airway protection should be available in the event of respiratory compromise. Continuous cardiac monitoring should be attained; arrhythmias, including ventricular tachycardia and premature ventricular contractions, as well as atrial fibrillation, flutter, and tachycardia, can occur.Renal function should be evaluated carefully and dialysis considered in cases of renal failure. In most cases, the renal damage is reversible if the patient survives the acute illness. Early initiation of hemodialysis or peritoneal dialysis considerably reduces mortality risk.Corticosteroid therapy is controversial.Treatment with high-dose pulsed methylprednisolone (30 mg/kg/d, not to exceed 1500 mg) has been used successfully to treat patients with leptospiral renal failure without dialysis. This approach may have be beneficial in resource-poor areas where dialysis is unavailable and would involve lengthy medical transport. The use of renal-dose dopamine in conjunction with steroids or diuretics has also been described. Pulse-dose steroids may also play a role early in the management of severe pulmonary disease. Patients with Weil syndrome may need transfusions of whole blood, platelets, or both. Ophthalmic drops of mydriatics and corticosteroids have been used for relief of ocular symptoms.